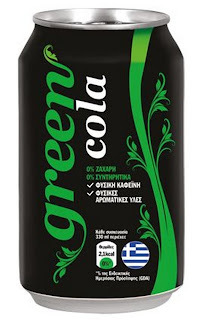 Move Over Coca Cola ... Greeks In Orestiadia Introduce "Green Cola"
Talk about a great development with a lot of potential. The Coca Cola plant might of left Greece leaving hundreds of people without jobs, but several businessmen up in Orestiada decided to introduce the "Green Cola" in the hopes of winning a fair share of the market! Obviously Coca Cola is one of a kind, and will forever be popular. The point of this article is that Greek innovative minds are working on overdrive and we are very pleased to see that although our country is in a deep recession, young minds are developing and introducing new products that are clearly "genius". This new GREEK product enriches the well-known cola with novel properties such caffeine from natural green coffee beans and includes natural flavorings. The good news is that it does not contain any sugars such as aspartame, and it certainly does not contain phosphoric acid, and preservatives. This unique initiative belongs to Association of Manufacturers CSDs (EMCO SA) in Orestiada, which was established in 1959 by a group of locals and has been operating for nearly 53 years in the production and bottling and refreshments. At present "Green Cola" is available all over Greece but the only set back is that it has a steep price, said to be 3 Euros. Hopefully production will increase in the future, and allow this drink to become a new world hit with soft drink lovers, and maybe then its price can come down.